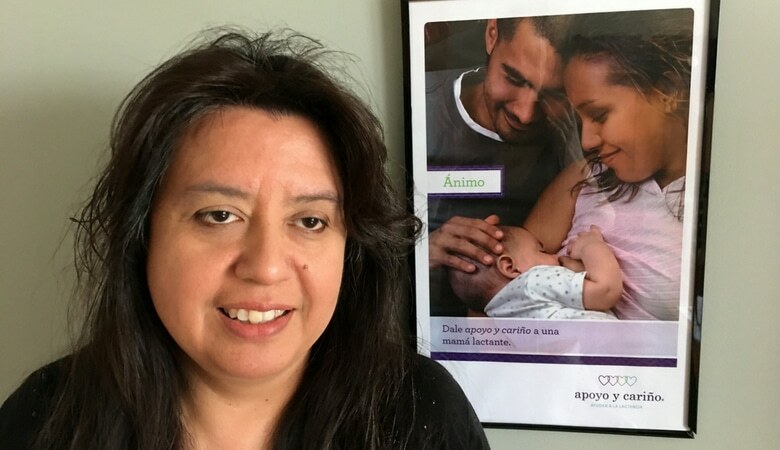 Mothers’ Milk Bank Northeast is proud to share that we recently launched a program focused on reaching Latina milk donors, thanks to a special grant from the Adobe Foundation. The grant will help us provide materials in Spanish, screen mothers in Spanish, and increase donor milk awareness in Latina communities. As a nonprofit milk bank, one of our core values is equity. While fragile babies are always eligible to receive milk regardless of their parents’ language, widespread education and culturally sensitive services increase access to donor milk. We are delighted to feature this interview with our new colleague, Daisy Boada, who was brought on as our first Spanish-speaking Donor Intake Coordinator. Along with screening prospective milk donors in Spanish, Daisy is visiting hospitals, breastfeeding groups, community partners, and conferences to educate Latina mothers as well as their healthcare providers and families about milk donation. Sybil Sanchez, former Marketing and Communications Coordinator, met with Daisy to learn more about her background and how she is helping develop Spanish outreach for the milk bank. In high school in Ecuador, I studied chemistry and biology, then I immigrated to the US in my late teens. Sometime thereafter, I entered the financial banking world (not yet milk banking, so that’s one kind of bank after another!). I worked there for 15 years. My job was located near my home, which was convenient as I focused on assisting my infirm mother, who eventually passed away. I have two children, a 21-year-old and a 16-year-old. Both were preemies, born at 36 weeks and at 26 weeks. I breastfed each of them and so I know firsthand what it’s like to breastfeed a preemie. Today, thankfully, my daughters are very healthy. My oldest just completed her third year of college, where she is studying economics and finance with a minor focus on criminal law. My 16-year-old just completed 11th grade and is studying for her license to fly small planes. She’s also applying to colleges. How did you learn about the milk bank? I first learned of Mothers’ Milk Bank Northeast when I was a breastfeeding peer counselor, counseling preemie mothers and others. Since becoming a lab technician at Children’s Hospital, where I still work part time, I have had the privilege of directly handling the milk bank’s pasteurized donor human milk, mixing it with human milk fortifier and preparing it for use in the NICU. When the position opened for a Spanish-speaking Donor Intake Coordinator, I was encouraged to apply by my colleague Karen Sussman-Karten, who is both a lactation consultant and one of the milk bank’s Medical Advisory Board members. I started with the milk bank last fall. I really enjoy conducting donor intake screenings with mothers, and I especially relate to those who have preemie babies. It’s so inspiring to learn about how medicine interacts with human milk and how much that impacts fragile babies in need. One day, for example, I screened a Spanish-speaking mother with a preemie. Her daughter was born at 26 weeks and she was pumping. I was able to share with her some of my own experience as a way of relating to hers and providing support. She said to me, “Oh, so everything is going to be okay with my baby, too!” I told her that everything is day by day, sometimes we’re up and sometimes we’re down, but we always have to stay positive. What is your focus when it comes to outreach? In particular, I was hired to work with Spanish-speaking communities. When I was a peer counselor with WIC, so many mothers didn’t really know about donor milk. Even I didn’t know about it at the beginning of my own journey! It’s so important to know the benefits and how it helps fragile infants. Along with screening donors, I want to help the milk bank reach more women so that they understand the true value of human milk as medicine along with how safe and beneficial milk banking is. By and large, many Spanish-speaking communities are not yet that open to donor milk. Some are, but certainly not everybody. It’s important to share the benefits with them and to normalize it. There are many large and diverse Spanish-speaking communities within our northeast region. In our immediate area alone, there are large immigrant populations from Colombia, Mexico, and El Salvador, plus, more broadly in terms of Latina cultures, a large Brazilian Portuguese-speaking community as well. The more services we can provide that are culturally and linguistically accessible, the more we can spread the word, and that’s the most important thing. Mothers’ Milk Bank Northeast is excited to expand our language services and promote the use of human milk as medicine in a way that’s inclusive and that provides broader access to more communities. Welcome Daisy, and thank you for joining our team! Stay tuned for more developments, including Spanish language sections on our website. Para leer este artículo en español click aqui.